it was so quiet this morning! like a snow day. how heroic these workers are! standing up to the man. while the media and all the idiots are calling them "morally reprehensible". not one source is covering the event from the worker's perspective. all the stories are about the inconvenience to the "stranded". i think we should celebrate people who aren't willing to just passively accept what's being offered to them. it's so impressive, all of them standing together like that. using their power. it's the kind of power that's disappearing more and more from our planet. power that doesn't come from the top down. american citizens can't give away fast enough the power that our predecessors fought so hard for. listen to any phone conversation you want, NSA guys! it's s'posed to be necessary! it's sad that it seems almost anachronistic, this spirit of struggle, troublemaking, courage. i wish i had been there to hand out sandwiches or something when they walked out this morning. at the world bank protest, in washington dc, in april 2000, after hundreds of people were "preempively" arrested, a group of central american guys from a fast food place handed out sandwiches to people from big boxes as they were released from jail the next day. no one gets a pension any more! but that doesn't mean that they shouldn't. i am all for fighting to keep the idea of a pension alive. i want a pension! wish i had a union. amazingly, there are some people left in the world who will still fight for a better life. 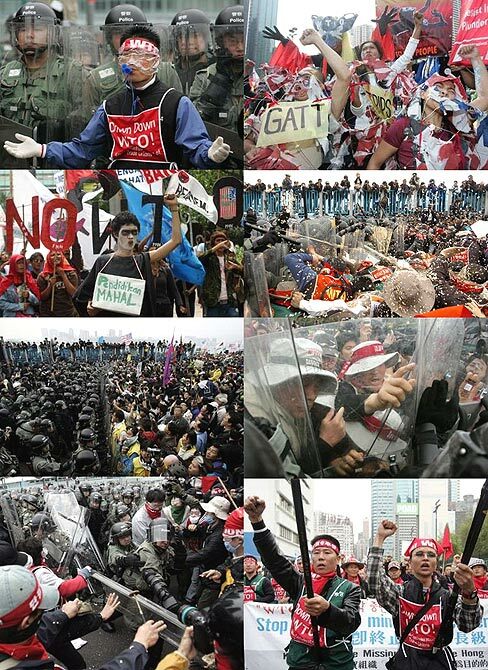 over the weekend, farmers from all over the world, mostly south koreans, stormed the WTO meeting in hong kong. they actually made it inside! i think we should celebrate people who aren't willing to just passively accept what's being offered to them. I celebrate them and hope they all get fired just in time for Christmas. Their union will likely be bankrupt too. This was the dumbest move of all time. Only a union could come up with it. And, did the farmers actually accomplish anything at the WTO? I mean, grand gestures and actions are cute but don't results matter at all? just because something isn't successful doesn't mean it's not good. that's one equation i've noticed you make a lot. it's called "might equals right". it inspired people. that's huge. people who haven't just given up and become cogs in the machine, that is. it takes a lot of people to fight the power. I'm a big fan of actions having a point or purpose other than general mayhem. It's not constructive. And it makes me take the protestor (or whoever) much less seriously than I would otherwise. And I know I'm not alone in that. 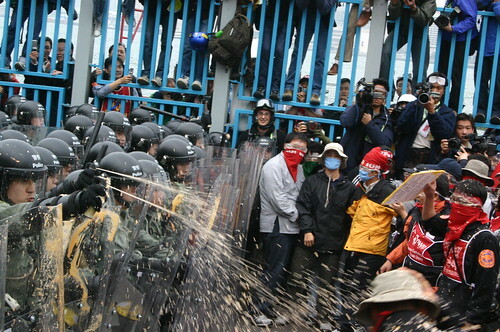 As for the farmers inspiring people, I don't see how crashing a meeting and yelling some slogans inspires anyone. How many people even know the purpose of their protest? it wasn't just general mayhem. the farmers' action did have a purpose; they wanted what they had to say to be considered in decisions that affected their lives. decisions made by people who admitted that they, among other things, were responsible for the collapse of the economies of several asian countries. after having been ignored repeatedly, at the eleventh hour, they did the only thing that was left to do. they were amazingly well-organized, as you can see from the pictures linked to below, and had plenty to say if anyone there had bothered to listen. as far as "how many people" who know "the point of their protest", people are increasingly turning away from the mainstream media, as you know, and all it takes is the will and an open mind, to find out the facts.